2019 marks the first time that the LIBER Conference will be held in Ireland. Renowned as a centre for music, arts, literature and culture, Dublin is the vibrant capital city of Ireland and home to over a million people. Located at the heart of Dublin city centre, at the meeting place of the cultural, technology, political and retail districts, Trinity College Dublin, the University of Dublin is one of the most famous institutions in Ireland. The LIBER Conference 2019 will be held in the beautiful city-centre campus. It will be held in collaboration with CONUL, the Consortium of National and University Libraries for the island of Ireland. As Ireland’s university on the world stage, Trinity College is recognised for academic excellence and a transformative student experience. Trinity is Ireland’s highest-ranked university, one of the world’s top 100, and a member of the League of European Research Universities (LERU). It is home to 17,000 undergraduate and postgraduate students across all the major disciplines in the arts and humanities, in business, law, engineering, science and health sciences. With a tradition of scholarship spanning more than four centuries, Trinity is home to talented and inquiring minds collaborating to provide a liberal education and conducting intellectual enquiry at the frontiers of research. Founded by Queen Elizabeth I in 1592, Trinity’s tradition of independent intellectual inquiry has produced some of the world’s finest, most original minds including the writers Oscar Wilde and Samuel Beckett (Nobel laureate), the scientists William Rowan Hamilton and Ernest Walton (Nobel laureate) and the political thinker Edmund Burke. A recent alumna is the former President of Ireland and former UN High Commissioner for Human Rights Mary Robinson. The current Taoiseach (Prime Minister), Leo Varadkar, is also a Trinity graduate. Trinity offers modern tiered theatres, plenary meeting rooms and exhibition spaces, with over 600 bedrooms on campus. The Library of Trinity College Dublin is known throughout the world for its unique buildings and for the strength and distinctiveness of its collections. The Library dates back to the University’s foundation year and is the largest research library in Ireland. Today, the Library has over six-and-a-half million volumes reflecting 425 years of academic development. The Library was granted legal deposit status in 1801 and continues to receive copies of material published in the United Kingdom and Ireland. The Old Library, which celebrated its tercentenary in 2012, contains the Long Room which is among the most beautiful libraries in the world. Nearly a million visitors cross its threshold annually. It is home to the Book of Kells, Ireland’s greatest historical artefact, which is listed on the UNESCO Memory of the World register. Other treasures include the Book of Durrow, James Ussher’s Library and the Fagel Library. Adjacent to the Old Library, the Berkeley Library, which celebrated its half-century in 2017, is one of the finest modernist buildings in Ireland. Although an institution of great antiquity, the Library of Trinity College pioneers modern methods of resource discovery and developments in the teaching, learning and research processes. CONUL (Consortium of National and University Libraries) brings together Ireland’s main research libraries, to develop and improve the library and information services of its members through the exchange of experience and the organisation of innovative co-operative activities. It has an all-island remit, with membership drawn from both the Republic of Ireland and Northern Ireland. 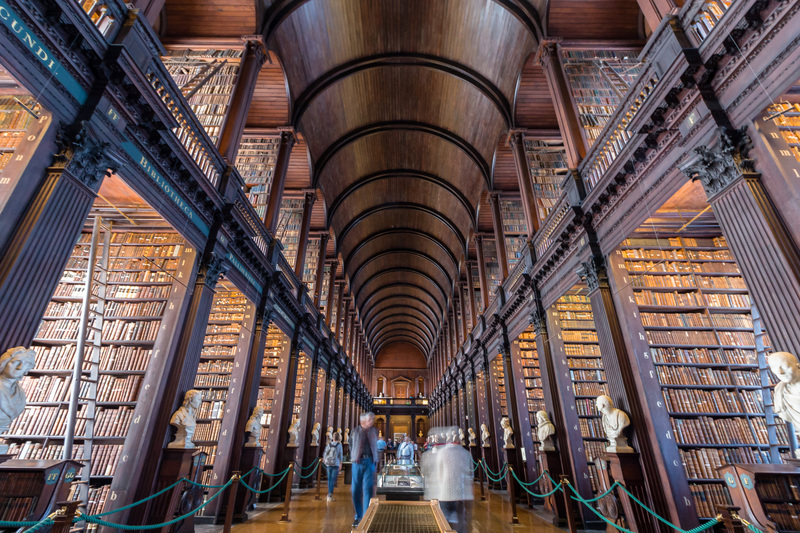 A CONUL Conference is held annually and the CONUL Board is very pleased to contribute its members’ expertise and knowledge by collaborating with the Library of Trinity College Dublin in the organisation of the 48th LIBER Annual Conference.